"I want to flag to you a meeting that will take place in Vienna this Wednesday. Matthew Nimetz, the personal envoy of the secretary-general, will meet jointly with Nikos Kotzias, the minister of Foreign Affairs of Greece and Nikola Dimitrov, the minister of foreign affairs of the Former Yugoslav Republic of Macedonia and that will be at the UN office in Vienna." The push to speed up Macedonia’s potential entry in NATO by the time of the alliance’s summit scheduled for July 11-12 in Brussels has gained momentum after the US-sponsored campaign of regime change that effectively toppled the government of the ruling VMRO-DPMNE party and forced a coalition of the Socialdemocratic Union (SDSM) of Prime Minister Zoran Zaev with Albanian political parties in 2017. Dujarric said the UN-sponsored meeting in Vienna on Wednesday is part of the United Nations’ ongoing efforts to assist Macedonia and Greece find a mutually acceptable solution to the name dispute. 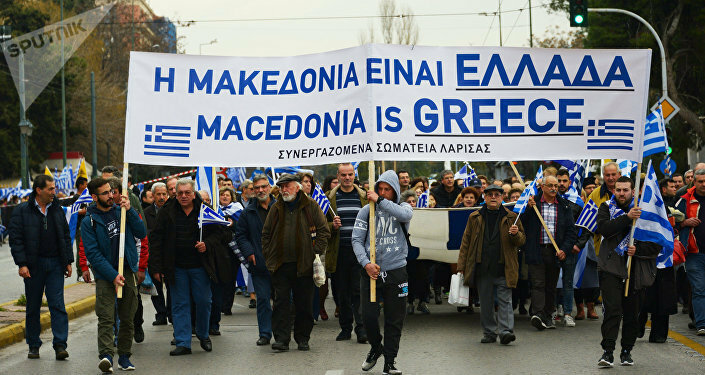 Since the early 1990s, Athens has objected to Macedonia using that name because a part of the historic region of Macedonia is in northern Greece. Athens considers that land to be the original Macedonia, whose historical and historical heritage it considers Greek. Macedonia has said the right to self-identification is a fundamental pillar of the international order and the demands made on Skopje are well outside the scope of the UN Charter. Moreover, Skopje has said Macedonian identity is unique, both culturally and historically, and the historical heritage from ancient Macedonia should not be monopolized by any one nation as it belongs to humanity. In September 1995, Athens and Skopje reached an Interim Accord that stipulates Greece will not veto Macedonia’s entry in international organizations, including in NATO, if membership is conducted not under its name, but under the temporary reference "former Yugoslav Republic of Macedonia." Yet, Macedonia was not allowed to become a NATO member during the alliance’s summit in Bucharest in April 2008 under pressure by Athens. In December 2011, the International Court of Justice in The Hague ruled that Greece had violated the Interim Accord. However, NATO said it was not bound by the UN court’s decision. In virtually all pols, Macedonians have overwhelmingly rejected membership in NATO and the European Union, and especially if membership is forced at the cost of erasing their ethnic and national identity.